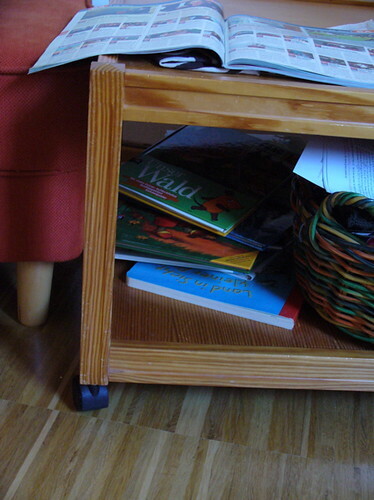 Last week I met with some fellow kindergartener’s mothers, and when I entered our hostess’s living room my first thought was, “Where are the books?”. There weren’t any. None. Not a single one. Now, I understand that not everyone is as book-addicted as I am but slowly I’m starting to see why some of my students (or of the people visiting our home) are asking, “Have you read all of these books?” or “You sure do have a lot of books!” when they enter the room where I teach. This always leaves me confused because, well, the books in my room aren’t really “the books”. Most people who ask me if I have read all of these books are actually looking at the comic section. And yes, I have read all of those. In the middle of the top shelf are the books I bought but haven’t read yet, a book on html next to one on Buddhism, under that there’s the “biographies and memoirs”-section that holds Rita Mae Brown, Bill Bryson’s books (that I really loved reading but I can’t stand re-reading them, maybe I should get rid of those), artists’ biographies, and much loved, the letters of Dorothy L. Sayers, one of my very favorite authors ever. Anne Modesitt’s book “Knit With Courage” about the year when they found out her husband has cancer, and “Eat, Pray, Love” are obviously the latest additions. I loved them both. And, coming to think of it, I seem to be drawn to memoirs by either artists or people with cancer. 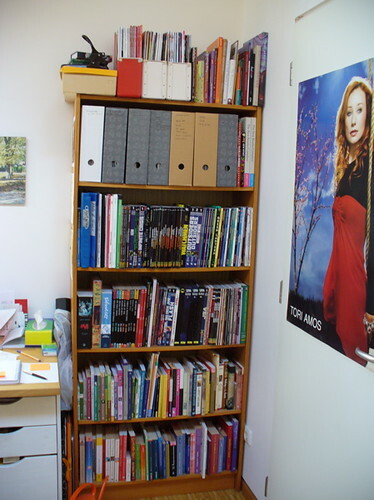 Under that you see miscellaneous music theory textbooks, and remnants of the days when I still was very interested in academic research. Books about Robert Schumann and his wife, books about female composers, about the “Matriarchy Myth”, cutlural anthropology, the almost complete works of Howard S. Becker, books on jazz, music theory, Brazilian music and such. I often have the feeling that this corner of my desk shows my life in one glance. 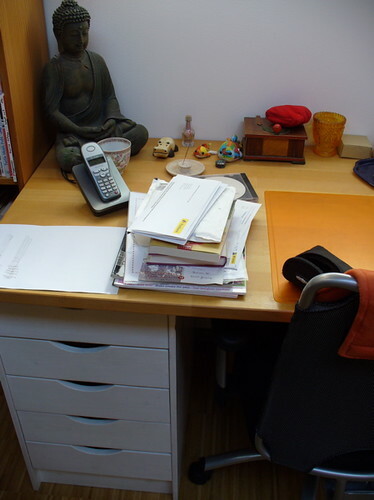 There’s a plastic Buddha next to the phone, a couple of knickknacks, a wooden box that my great-uncle (whom I never met) made for an aunt (whom I never met either because she died of tuberculosis when she was only 20), and that was a cherished possession of my maternal grandmother. The box holds my tarot cards. 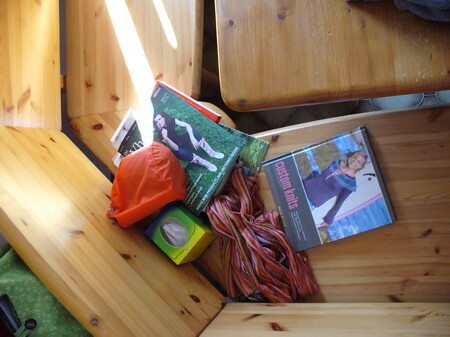 In the foreground is a pile of official papers, knitting and sewing patterns, magazines and books. There is “The Idle Parent” a book I love with a vengeance, and one of the few books I read in the last months that made me nod my head constantly, and then there’s a book called “Zum Buddha werden in 5 Wochen” (Becoming a Buddha in 5 weeks) that’s probably more of a joke than anything else but it looked entertaining in the book store. It’s right next to the piano and holds most sheet music, an anatomy book for showing my singing students how their voices work, Tori Amos songbooks, Dresden Dolls songbooks, four or five tomes of Jazz standards (middle shelf), and my practice journals. 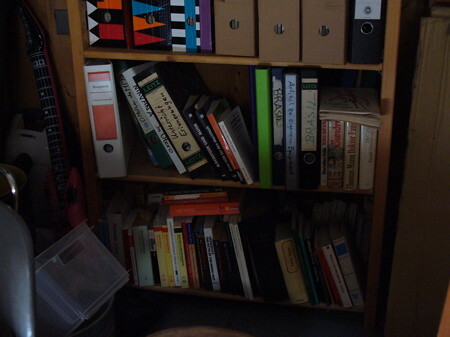 I’ll spare you a picture of my husband’s books in his teaching room/office/studio but there are about two shelves holding books about music, and musicians there. Also a nice little pile of what he is currently reading. The next room would be our former guest bedroom. Since we have removed the bed from there, and are using it as a TV room we probably should be calling it a living room, only it’s so small that we don’t even have a sofa in there, only two chairs. First, the actual in-use children’s books. There is a very good series of non-fiction books called “Wieso? Weshalb? Warum?” about the usual topics, dinosaurs, Native Americans, space, the earth, numbers, letters, and such. There are a few treasured stories, classics like “Pippi Longstocking”, or newer ones like the “Drache Kokosnuss” (Dragon Coconut) series. The lower left shelf holds the books we got from the library. This one mostly holds my husband’s older books. 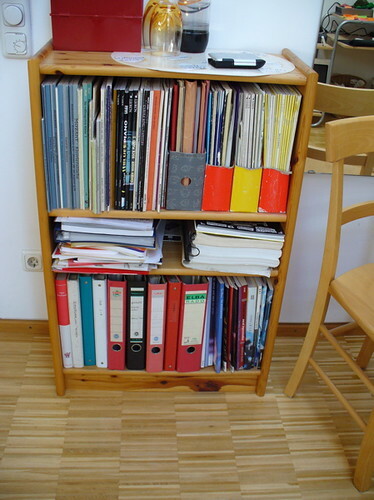 The complete works of Goethe, Heine, Shakespeare, Adorno, Benjamin, Trakl, some Proust, a lot of philosophy books. On the top shelves are our art books, most of those also belong to my husband. The thing above the tea kettle is our encyclopedia, by the way, my husband gave it to me as a birthday present, and it has got art by Udo Lindenberg, a German musician. the art is a bit weird, and I have frequently found myself in a position to explain to my son why there are aliens, and nuns, the devil and all these women without much clothes on there. That’s what you get when you keep pulling out the encyclopedia to look things up all the time, I guess. Top left is fiction. 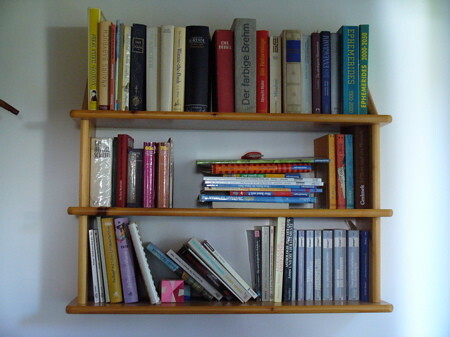 In alphabetical order you’ll find authors like: Rita Mae Brown, John Irving, Tom Robbins, and a few others that I don’t remember at the moment. (In case you’re wondering, I did start to read “Ulysses”, and rather liked it but then I lost the groove and never finished it.) Under that are two shelves of detective stories, again Rita Mae Brown, Amanda Cross, Diane Mott Davidson, and my all-time favorite Dorothy L. Sayers. If I ever get rich I’ll buy all her novels again, this time in English. I only own the German translations to most of them because I started reading her when I was 12 or so. Recently I bought all the Miss Marple-stories, those are the fat books lying on top of the others. (Maybe I really should stop buying books.) Under that are spy thrillers. I especially cherish the original James Bond novels (which I can’t seem to find in English, what a pity, so I have to content myself with translations) and the “Modesty Blaise”-series which I can’t seem to find in English either. Weird. 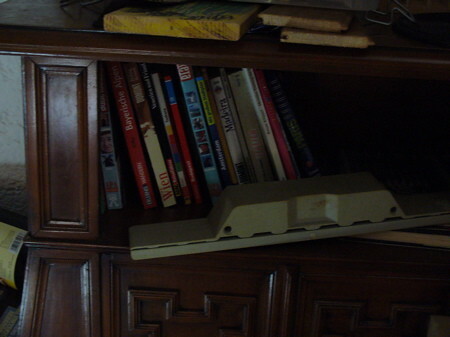 The lowest shelf holds all of the cookbooks we use. There are more in a box in the garage but these are the ones we’re using. We’d still like to have one on Chinese cooking but we don’t really cook much from recipes. Mostly it’s my husband starting out with whatever I brought home, and a vision. He’s a fabulous cook. Mostly we pull them out on Sundays and drool over the pictures. 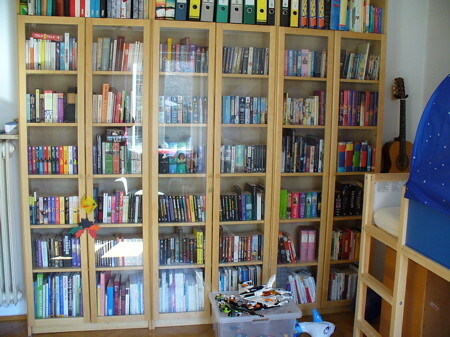 The middle and right bookcases hold all of my science fiction and fantasy novels: Douglas Adams, C.J. Cherryh, Alan Dean Foster, Neil Gaiman, Robert A. Heinlein, Terry Pratchett (a lot of Terry Pratchett, in hardcover), J. K. Rowling, Stephen Donaldson, Cailín Kiernan, Tad Williams, a bit of Marion Zimmer Bradley, and then the poetry section. Emily Dickinson, Wilhem Busch (not exactly poetry but it rhymes), Christian Morgenstern, I’m not much of a poetry reader. Then there’s another shelf of comics, mostly Ralf König, and some indie comics from the 80s, a shelf of self-help, and medicine books, books about weight loss and such, and on the top most shelf that you can barely see, the parenting books. 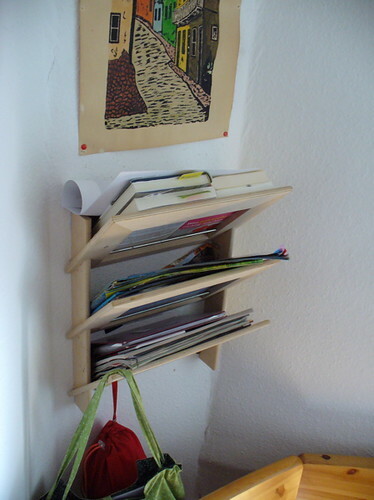 The magazine rack is for storing current reading, magazines and books, and I installed it to prevent the kitchen bench to look like the picture above. It looks untidy and things keep falling off the bench. Mostly through the crack where you can’t retrieve them without crawling under the table, and contorting yourself, and getting dust all over you and the books. The books I am currently reading are laying around on the kitchen bench. You can’t see them properly because I opted for realistic shots but there is “Drawing With Children” which I love, “No Idle Hands” a history of hand knitting in the US, “Custom Knits” which arrived today, and I already love it, and “The Creative Family” which I pulled out because I wanted to show my son what children are able to sew and make. There’s also a spinning magazine, and knitting bags. Travel guides. I threw most of them away because the information in them gets dated. Also I doubt that I will be going back to places I already visited anytime soon. You can tell that we aren’t big on traveling. More ethnology and cultural anthropology, and music education, and sheet music, and books on African and Brazilian and Indian music. Both my husband’s and mine. Also all the papers I wrote in university. And books about teaching music, “Mr. Nice”, and back issues of “Gitarre & Bass”, a guitar magazine my husband has been reading and collecting for decades now. We shouldn’t be storing these down here because the basement gets very damp in summer. All the books down here have a musty smell, and if you put anything on the floor it will get moldy. But as you can see for yourself, we’re running out of storage space here. And I’m actually going through the books at least once a year, and give some away. As I said before there are still boxes of books in the garage (books that we don’t really use anymore but do want to keep anyway), boxes in the attic (books that I once wanted to sell but never got around to). This once was the place I kept the diapers, and my son’s clothes. Now it holds dictionaries. And the hand-dyed sock yarn. 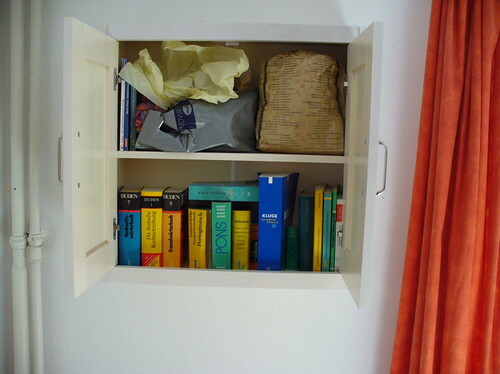 There’s a French dictionary, and Italian one, several German ones, a book of names, some grammar books, two Portuguese dictionaries, and two etymologies. By the way, which English etymological dictionary would you get? Or would you look on-line? We have two german ones, and I’m not really happy with those. I always have the same problem with dictionaries and encyclopedias, they are too small, and don’t hold the things I’m looking for. 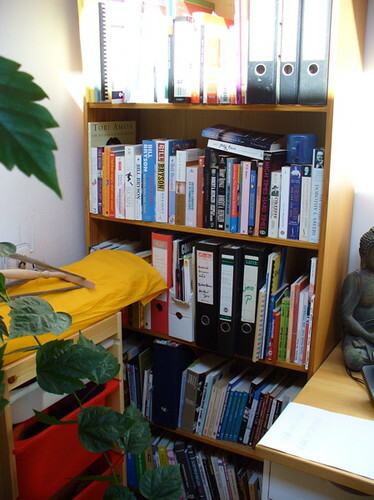 A room without books… there is such a thing? Like you that wouldn’t be possible in our household. 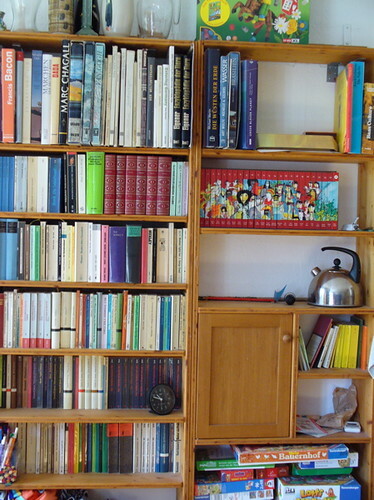 To think of a home without books… sounds almost creepy. 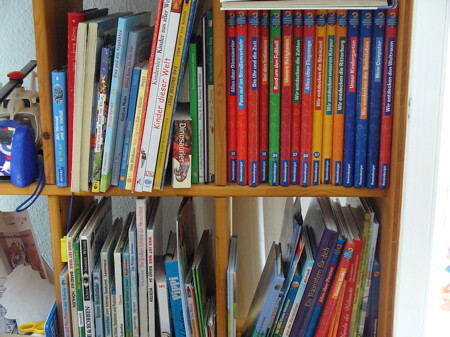 My kids like to read alot, though now, they do the majority of their reading online. We still supply them with books, but, at least in my son’s case, his fascination for news and technology is best appeased by reading 10,000 articles/month online. i love a house full of books. Well this is exactly how I love a house: books just everywhere. But your shelves are really tidy, too. 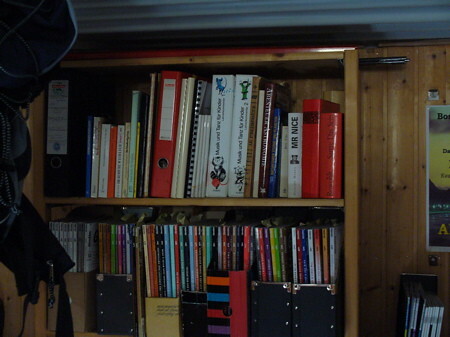 Whenever mine overflow with books, I end up with a glitch of chaos in at least one of the shelves… Currently it’s the one behind a DOOR 🙂 so this is well hidden for now, but I have to start preventing that the “bug” spreads to open shelves! I am SO IN LOVE WITH YOUR BOOKSHELVES. Lusting over them, actually. The shelves and all the stuffed goodness they hold. I would always be borrowing something when I came over. My first instinct was to say I could easily send you James Bond in English, but I could not add to your collection in good conscience. I’d go online rather than purchase an English etymology. De, I don’t lend my books to everyone but to you I would. I just found out that I could get both the Fleming and the O’Donnell books here too. Even used and a bit cheaper. If I bought those (which I won’t at the moment) I would throw out the German editions. I don’t like translations, at least not when I’m able to read the original. Helen, when mine overflow I throw books out. (Or put them in boxes or in the basement…) I can’t keep them all forever. I also read Green Lantern. That Tori Amos poster made me laugh!